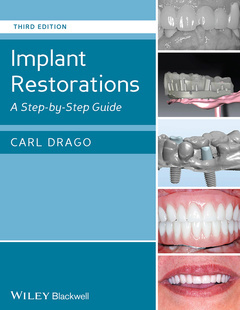 Implant Restorations: A Step?by?Step Guide, Third Edition offers clinicians a practical, step?by?step approach to treatment planning and restoring dental implants. This highly illustrated, case?based book demonstrates how to treat the most commonly encountered treatment scenarios, describing the procedures, techniques, and sequences required in clear, concise language and in an easy?to?use format. The book takes the theory of implant restoration, using as its basis 3i?s implant systems, and places it directly in the operatory, concentrating in detail on each stage of the actual clinical procedures involved in treating different patients. It integrates implant treatment with the realities of running a successful restorative practice. Building on the work of the 2nd edition, the 3rd edition of this successful text reflects the advances of implant prosthetics over the intervening years, providing all new cases, exploring new techniques and technology, and demonstrating updated system components and armamentarium. Implant Restorations: A Step?by?Step Guide follows a logical structure of three sections. The first section introduces implant restorative dentistry, how to develop an implant restorative practice, the issues involved, the technical components of the 3i systems, diagnosis, and treatment planning. The central section of the book devotes separate chapters to in?depth descriptions of each of several types of patients that the restorative dentist may encounter, ranging from basic to more challenging cases. Every step of each procedure is described and illustrated with clinical photographs. Laboratory work orders are presented for use with commercial dental laboratories. The final section discusses record?keeping, patient compliance, hygiene regimes and follow?up, and provides the reader with an outline of best?practice procedural protocols. An excellent and accessible guide on the most burgeoning subject in modern dental practice by one of its most experienced clinicians, Implant Restorations: A Step?by?Step Guide, Third Edition will appeal to prosthodontists, general dentists, implant surgeons, dental students, dental laboratory technicians and dental assistants. Carl Drago, DDS, MS, is a Diplomate of the American Board of Prosthodontics (ABP) and serves as the Clinical Science Editor of the Journal of Prosthodontics, the journal of the American College of Prosthodontists. His private practice near Milwaukee, WI, is limited to fixed, removable, and implant prosthodontics. Dr. Drago is the clinical director of Eon Clinics in Waukesha, WI and is an adjunct associate professor at the Marquette University School of Dentistry. He has held positions as Assistant Professor at the University of Texas Dental School at San Antonio and Associate Professor in the Department of Restorative and Prosthetic Dentistry at the Ohio State University College of Dentistry in Columbus, OH. He has published more than 75 papers on various subjects including laboratory and clinical procedures in conventional and implant prosthodontics. Dr. Drago has also written three textbooks on dental implants, including Implant Laboratory Procedures: A Step by Step Guide, published by Wiley Blackwell.